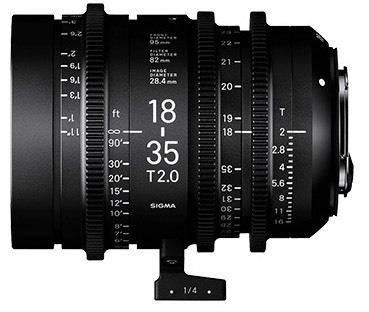 Sigma today at IBC announced a new series of lenses, the manual focus Cine series. The first two lenses will be available in November: the crop sensor 18-35mm t/2 and 50-100mm t/2. A series of primes (20mm, 24mm, 35mm, 50mm, and 85mm t/1.5) as well as a full frame sensor 24-35mm t/2.2 will be detailed later and released in 2017. The Sigma Cine lenses will come in three mounts: Canon EF, Sony E, and PL. Just yesterday I wrote about Nikon’s lack of enthusiasm for video other than as a feature in its DSLRs; Sigma’s decision in mount support is clearly predicated on a similar analysis that Nikon isn’t going to be a significant player in video. Obviously, all these lenses are predicated on existing Sigma lenses. The 18-35mm and 50-100mm t/2 lenses that will appear first are variations on the 18-35mm f/1.8 and 50-100mm f/1.8 lenses. The primes are all predicated on the f/1.4 Art lenses. But these Cine lenses all have gearing and filtration in standardized positions and sizes, which is what the video industry prefers, as it facilitates their use of camera rigging that doesn’t have to be changed between shots. Each lens also has very large and clear aperture, zoom, and focus markings that are created with luminescent paint. In many ways this is similar to what Samyang/Rokinon has done with the Xeen set of lenses (converted existing lenses to cinematic usefulness with standardized sizing and gears). And for video shooters, this is a great announcement, as it just increases the options for solid, excellent performing lenses, and probably at reasonable prices (prices weren’t announced). The interesting thing is that the 18-35mm was already available in a re-housed form from GL Optics (PL mount). That said, Sigma doesn’t indicate whether their new Cine lenses are parfocal, as was the GL Optics conversion (most zooms, including the two Sigma f/1.8 lenses, are varifocal, which means they change focus plane as you zoom, a no-no for video).